According to the Federal Reserve Board, consumer credit outstanding expanded over the month of November 2014. However, the rate of expansion was slower in November than it was in October. On a seasonally adjusted annual rate basis, total consumer credit, which excludes housing related credit such as mortgages and home equity lines of credit, rose by 5.1%, $169 billion, over the month. The November rate of growth was 0.8 percentage points slower than the 5.9% growth rate that was recorded in October. Despite the decline in the growth of consumer credit outstanding, November 2014 marks the 40th consecutive monthly increase in consumer credit. Over this 3 year and 4 month period, consumer credit outstanding has risen by 21.5%. The month-over-month increase in the amount of consumer credit outstanding reflected a rise in the amount non-revolving credit outstanding, however, the decline in the growth rate of consumer credit outstanding reflected a decrease in revolving credit outstanding. According to the release, non-revolving credit, which includes auto and student loans, rose by 7.5% in November 2014, 0.2 percentage points faster than the 7.3% increase recorded in October. Meanwhile, revolving credit, which is largely composed of credit cards, fell by 1.3% over the month, partially reversing the 2.0% increase recorded in October. The chart above illustrates that non-revolving credit contributed less to the most recent decline in consumer credit outstanding and has accounted for all of the broader resurgence in consumer credit outstanding. Between 2008 and 2009, total consumer credit outstanding fell by $98 billion, revolving credit outstanding declined by $88 billion while non-revolving credit outstanding recorded a $10 billion decrease. 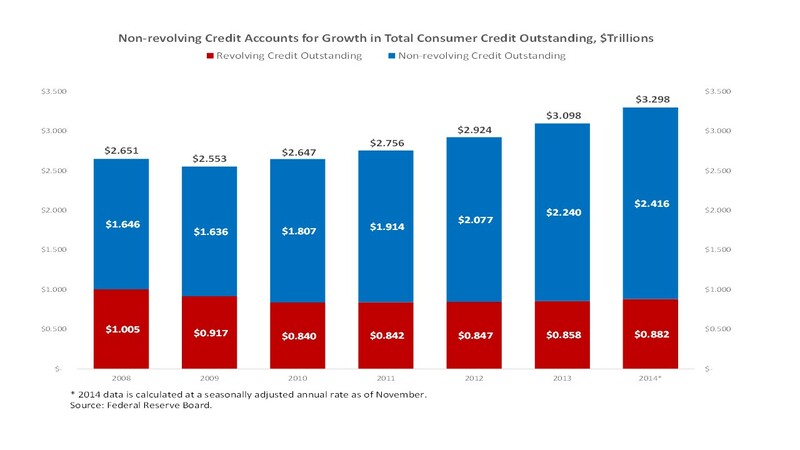 Since 2009, total consumer credit outstanding has expanded by $745 billion, non-revolving credit outstanding has grown by $780 billion, but revolving credit outstanding has contracted by $35 billion.